A year has passed since Kazuma Kiryu left the world of the Yakuza behind during the events of Yakuza Kiwami. 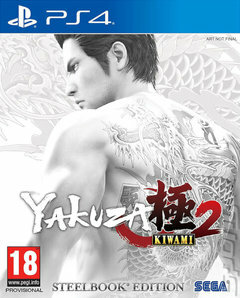 Organised crime is a hard world to leave, however, and the Dragon of Dojima finds himself facing all-out war on the front lines in Yakuza Kiwami 2. Following in the footsteps of the first Kiwami game, Kiwami 2 is a remake of Yakuza 2, a classic that arguably didn't find its audience in the west the first time around. It's been rebuilt from the ground up for the current generation, though, and the use of the Dragon Engine developed for Yakuza 6: The Song of Life means that it might be the smoothest and visually most impressive game in the series to date. As ever, a huge part of the fun is in immersing yourself in the game's Japanese world. New heat actions have been created (often with hilarious consequences, like smashing someone round the head with a busker's guitar), new minigames such as Golf Bingo have been included, Majima's Clan Creator has been revamped and SEGA's infamous Toylets even make an appearance! Beyond the extras, transitions into buildings is more seamless and you might even find your fights crashing from the streets into a store or sushi restaurant. The core open-world gameplay is intact, of course, and there's even a brand-new Majima-centric campaign charting his personal journey from Kiwami to Kiwami 2. A whole world of vengeance, violence and karaoke awaits!